Snugpak says:"Knitted polyester that stretches and is designed to hug your body when inside the sleeping bag. It maintains excellent warmth to pack ratio. Adds that extra season of warmth to any sleeping bag." The idea is that you put your sleeping bag liner into your sleeping bag and then you get into the sleeping bag liner and the combined effect of the liner and the sleeping bag keeps you warmer than the sleeping bag would on its own. Which of course it does, but I found wearing an extra layer in my sleeping bag - like a t-shirt & long johns or thermal underwear - performed just as well. I also spent half the night tangled up in the sleeping bag liner which got pretty frustrating. 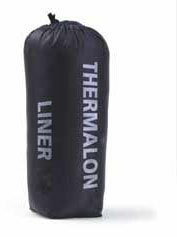 Made from 100% polyester the Snugpak Thermalon Sleeing Bag Liner wicked well and washed and dried quickly. However, at 340g it is just too heavy to consider taking on a back-packing trip when the weight of your pack is a crucial factor. Sadly, the weight to performance ratio of the Snugpak Thermalon Sleeping Bag Liner just isn't good enough when compared with cheaper, more practical alternatives. If you are a regular summer back-packer looking to travel light (and insist on having a sleeping bag liner) buy a lighter-weight, better performing, albeit more expensive, silk sleeping bag liner to combat that occasional cooler night - or just wear your set of dry clothes. If you are a regular winter back-packer - get a higher rated sleeping bag. A good higher-rated bag will be lighter than a lower-rated sleeping bag and a liner combined. If you are a 'drive-in and camp' camper - take a duvet or thermal underwear or some spare clothes or a blanket (or a friend).